Google Map a giant, smooth and one of the fastest map is touching every part of your life by helping you find any location by just clicking on single search button. 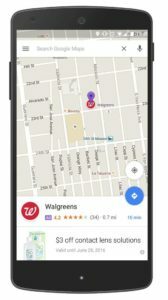 And now Google Map is looking to redesign its mobile experience of google Map by showing some relevant ads tagged as Google Map advertisement. So what kind of ads would be shown on Google Map? Either as a purple pin on the map or as a logo would appear at its exact physical location on digital map, within the visible map area or near by you location. 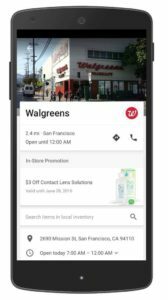 You can see an examples purple pin ad of ‘Walgreens’ as shown in the image provided below. 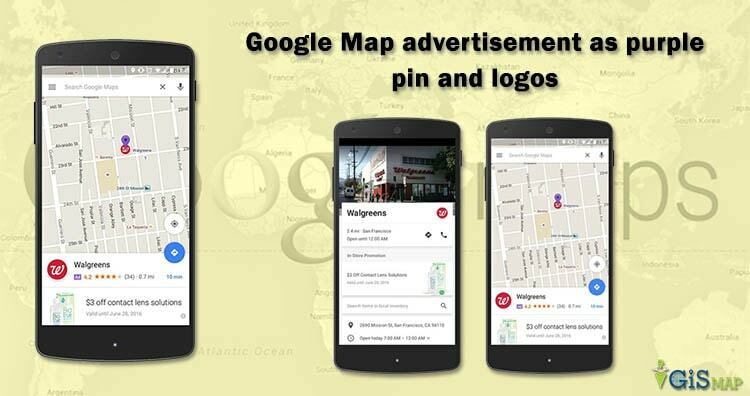 Along with pin ads Google map will also feature in-store promotions i.e when you expand a business page. Where you can see also see deals and coupon for sale items along with store hours and address. A small purple box with the word ‘Ad’ will highlight ad placements. When will the ads will be shown? While the relevancy of ads would be better applied when you are using the app and searching for some kind of location. For example if you search for a nearby hotels, Google Map can show a purple promoted pin or its company logo which will be more attractive than any other. Also while you are driving and using google Navigation function, a purple pin may appear sometimes, which locates nearby restaurant or gas station. This ads may be definitely be useful sometimes as people or driver would get aware of the location of some place of a route. As Google takes care of user experience so you don’t need to worry if ads might distract the drivers attention from the navigation route shown. Obviously Google this effort is to make more money, i.e as ads will be shown to users where they receive more than a billion visit on a Google Map. Although according to Google their first priority is to make sure the advertisement should be useful to users. Also for now, voice direction won’t have any audio advertisement, so that’s a good news while the bad part is that user would not be able to turn off the promoted pins. Have you seen any Google Map ads till now? If so, please share your experience by commenting here below.